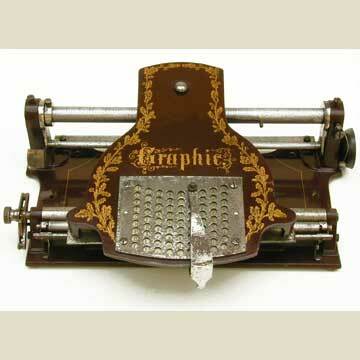 Except for its almost baroque appearence, the Graphic is a technical clone of the Hall typewriter. The mechanism and type layout are identical to the Hall. The Graphic is quite a bit heavier and more solid than the Hall. It was introduced at a time when this system had all but outlived itself and it is a very rare machine. Kindermann passed production on to Bonnin after the turn of the century when an improved version was marketed. See the book TYPEWRITER, page 155.